Michelle Riordan-Nold of the Connecticut Data Collaborative shares how a public-private data partnership is improving decision-making across the state. The CT Data Collaborative (CTData) is a public-private partnership between the state government and the nonprofit sector in Connecticut, created to advance effective planning and decision-making through the use of open and accessible data. CTData serves residents, nonprofits, policymakers, and funders in using and sharing data to drive policy, program, and service improvements. CTData provides public access to thousands of quality of life indicators in Connecticut using open source visualization software on CTData.org, and develops value-added products for raw data sets that integrate and thoughtfully present information in a meaningful and accessible manner. We also advance the agenda of broader public access to data and advocate for policies to encourage open data platforms. CTData promotes and facilitates open and accessible data to support the public good. We want to help organizations acquire, process, and leverage data to inform better decisions across the state. Promote and model the use of data standards for privacy, interoperability, data definitions, and quality. Metadata are displayed with each of our 150+ data sets. This information is critical in helping our consumers be educated users of the data – to know the suppression rules, the strengths and weaknesses of a data set, how the data are collected, field definitions, etc. In an effort to promote good data standards, we display margins of errors on the visualizations of our American Community Survey data sets. In 2009, a group of policymakers from the Governor’s Early Childhood Cabinet realized there was no way to access public data about youth or to compare data across agencies. The group formed the CT Data Collaborative and received private funding to develop ctdata.org. In April of 2012, we launched the site at a Special Meeting of the State’s Appropriations Committee. The Legislature expressed strong support for the Collaborative because of the ability of its data and visualization tools to enhance implementation of the Legislature’s Results-Based Accountability Initiative and to drive ongoing analysis of population outcomes tied to state-funded programs. CTData now receives funding from both the legislature and private sources, and from project-based work with government agencies. In the spring of 2014, the Governor issued an executive order mandating executive agencies to make public data available through the state’s Open Data Portal. The Governor also appointed a Chief Data Officer for the state with the responsibility of overseeing compliance with the Executive Order. With Connecticut now focusing on making data available to the public, we have one entry point to advocate for open data, but it has also allowed us to engage a broader audience in using and understanding data through our data visualization tools. The Connecticut Data Collaborative worked with the Commission on Aging to help them visually tell the story of the demographic changes in the state. 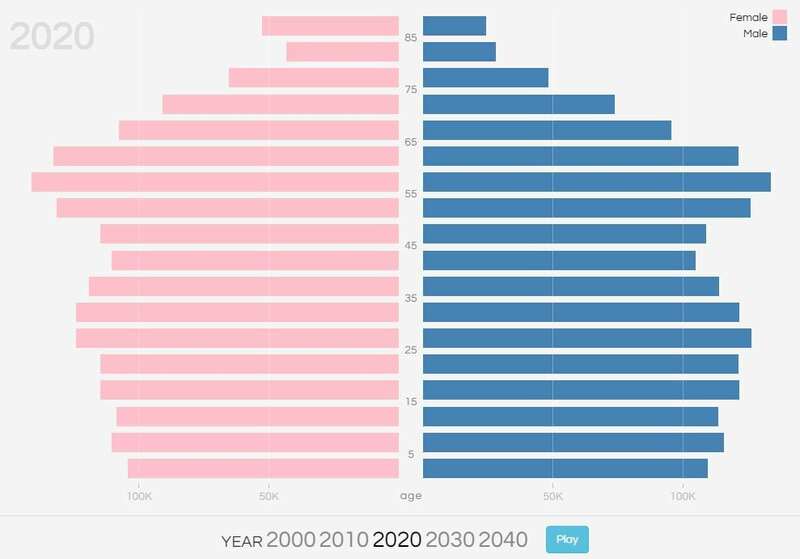 This interactive graphic demonstrates current and future demographic changes by age and gender. This effort started as a consortium of engaged individuals and organizations who wanted to create common standards for social and economic indicators and performance data, and enable access and distribution of data. Since a significant portion of the data are public government data, it was critical to have the government sector as a partner in the effort. The public sector relies on feedback from private users of data to help inform their decision making and similarly, the private sector needs public data for performance measurement and decision making. Therefore, a public-private partnership is critical to formalize the communication between the producers and users of data. CTData serves as a data intermediary and bridges the gap between these two groups. We work closely with the State’s Chief Data Officer to identify high-priority data sets for users, with the user community to identify public data needs, and with organizations to help them better use data. Data are often collected for service delivery purposes and not necessarily to inform policy, so although we are inundated with data, it is not always the right data. As an organization outside of the government, we can help formalize that relationship and inform better decision making in the collection and use of data. As more data enters the public domain and as government demands more of its private providers in terms of demonstrating performance measurement, the bar for data literacy increases. We are now launching a statewide initiative in partnership with the State’s Chief Data Officer called the CTData Academy. The goal is to increase data literacy, build data capacity, and enable nonprofits, state and local government, community groups, and organizations to more effectively use data to understand, measure, advocate, and impact lives. Often, nonprofit staff don’t realize that they are creating data during service delivery, or how to use the data for performance measurement. A key challenge for most organizations is determining how to operationalize the collection of data. Systems at most nonprofits are designed for service delivery but not for data collection or analysis. Collecting, structuring, storing, transmitting, aggregating, and analyzing data are areas in which we work closely with social sector organizations to develop the internal capacity and skills they need to leverage data for social good. Through our data platforms we have established rigorous standards for data documentation, pursued open data policies at the state level, created subject matter portals for specific partners, and built a strong community of data users. The work of CTData has provided an important service to the citizens of Connecticut by ensuring open access to information that can be displayed in compelling formats with powerful visualization tools. The decision to establish an organization outside government was intentional and is worth explaining. Often government agencies feel ownership over the data they collect, and they tend to operate in silos. We felt it was important that our organization have no vested interest in specific data or outcomes so that we could freely facilitate broad and universal access to data without being at the mercy of the political climate. Being outside of government also enables us to be nimbler, provide services to other entities outside government, hold government accountable to the public interest, and be a data provider in our own right. However, this also means that we must raise funding to support our efforts. We have managed to secure some state funding, but with the Connecticut fiscal crisis worsening we are feeling increasing financial pressure. Philanthropic funders tend to look for project-based outcomes and it is difficult to raise funding from the philanthropic community as a data resource, a role that many see as providing a public good. Looking back, we feel the decision to remain non-governmental was a wise one for many reasons. Looking forward, we know that we need to diversify our funding model to ensure that we remain a public data resource providing open, accessible data for all residents of Connecticut. Does your state have an open data initiative? How does it compare to the CT Data Collaborative? Chime in below with a comment. You can also follow CTData on Twitter and connect with Michelle Riordan-Nold on LinkedIn. To stay up to date with the latest from Markets For Good, sign up for our newsletter and follow us on Twitter. Better yet, become a contributor!